The Dukan Diet 7 Day Plan: It’s Just Protein & Oat Bran Really. There are 4 phases to the Dukan diet. The first phase, also known as the 7 day plan is where you experience the biggest weight loss results. But if you examine this phase, you’ll see that it’s really nothing more than just eating a lot of protein and oat bran. 1. You must eat only eat protein for 7 days. Details: There is no limit to the amount of protein you can consume. Typically lean meats, fish and eggs are what compose the majority of your food list in this period. A) This phase doesn’t always last 7 days. Depending on how much weight you need to lose, the attack phase can last anywhere from 5-10 days. Usually 7 is the average amount. C) A lot of people may experience constipation and tartar build up from all the protein consumption during this period. 2. You must drink 8 glasses of water a day during this period. This is not only healthy, but it does help with the side effects you can experience in the attack phase. It basically helps the food digest better. 3. You have to eat 2 teaspoons of oat bran everyday. Oat bran is something you’ll need to eat everyday that you are on the Dukan diet, whether it be the attack phase or the other 3 phases. This is a food that when eaten expands in your stomach, thus giving you the impression that you’re feeling much fuller. Though during the attack phase it won’t really make that much of a difference since there is no caloric restriction on how much you can eat, because oat bran possesses a high satiety number, it’ll help later on the diet. A lot of people tend to think that just because the Dukan diet helps you lose a lot of weight during the first 7 days that it’s an amazing plan, hence they try it. But it’s really nothing more than just consuming protein in large amounts. If you do this on your own, you too will experience results. There’s no magic to this. A) The length of time you’re on this diet will GREATLY increase. Phase 2 can last for several weeks, while phase 3 can last for weeks and even months at times. B) The amount of weight you lose will GREATLY decrease. During Phase 2, you may experience 1-2 pounds of weight loss a week while in phase 3, the weight loss results are basically non-existent because phase 3 is really a stabilization phase, not focused on weight loss. More details on the other phases. This can be extremely discouraging to a lot of people. The Dukan diet, even though it gets results initially becomes pretty difficult to deal with as it goes on. Not to say that’s bad, but usually diets that have little room for flexibility and last a long time are unsustainable in the long run. You can certainly try just the 7 day plan of the Dukan diet and forget the other phases as well, but there has been speculation among medical doctors that consuming so much protein may not be healthy for you. Hence, the side effects. The Dukan diet does work, but the truth is there are much better, healthier and shorter alternatives available. The #1 recommended diet on this website is one those options. I need to lose 60 lbs. I have 6 months to lower my A1C level. I would love to lose 50lbs by then. 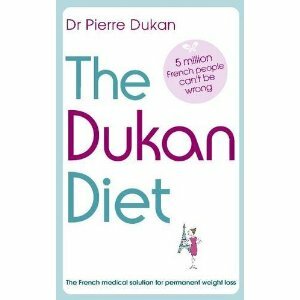 I’m interested in the Dukan diet. Only problem is I suffer with painful hemorrhoids. What can you do to relieve or avoid the constipation? Fiber is one of the missing pieces to avoiding constipation Hellon, what I would recommend isn’t really the Dukan diet for you, but something that has more fiber/vegetable based foods early on. However, are you diabetic or close to it? If so, then I would consult any diet plan you plan on doing with a doctor first since you mentioned A1C levels. You need a diet plan that will have you lowering your sugar, but not to dangerous levels and a Doctor will be able to tell you the diet you picked will suite you there. If not, let your doctor design a custom plan that will help you drop those 50 pounds. 3 years ago I had my stomach stabled and now my liver has stressed I’ve realised I have put on a 6 kgs and no longer fluctuate from 72-75kg. I have not reached my ideal weight which is 65 kgs and would like help in achieving my goals. I am a diabetic who is no longer insulin independent, just use oral medication to manage my diabetes. My last HCB1 results was at 50. Hi Ethel, I don’t want to give you any advice that would harm your health, but you should really visit a nutritionist or doctor and have them plan you a specific diet. You have a very sensitive situation which requires oversight from a professional. I really need to lose more than 30 pounds, but if I can do this diet and loose 30 pounds I will be super happy. It would take months through this diet Dalia. Do the 3 week diet instead. You’ll lose those thirty pounds in under a month.